Hatters defender Matty Pearson was thrilled to play a part at both ends of the pitch during his side’s 1-0 win at Southend United on Saturday. The imposing centre half arrived on cue to power home his header from James Justin’s corner on 29 minutes to open the scoring for Luton with his fourth goal of the season. Pearson was then part of a back-line which kept the Shrimpers at arm’s length for the remaining hour, to pick up a 17th league win of the season. He said: “We’ve come through at the end where it got a bit tense, but a fantastic win, that’s what we all wanted and a great feeling. “That’s what you play football for as a defender, a 1-0 away win is better than anything and a great feeling. “JJ’s delivery is spot on and me and I’ve always had a little thing for getting goals. Scoring the winner was an emotional moment for Pearson, after he revealed he had missed training this week due to a family illness. He continued: “My dad went into hospital early Thursday morning, but seems to be all right now, so I missed all the training, but it makes it all sweeter with a goal. 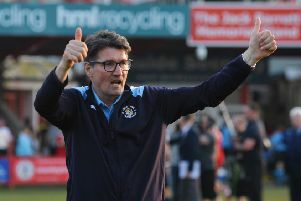 For interim boss Mick Harford, it was a joy to witness the work in training pay off on a match day, as he said: “Set-pieces are so important. Steve (Rutter, assistant) and Ini (Inigo Idiakez, first team coach) and myself, we work on them on a daily basis. “Good deliveries, good runs, Matty and Sonny (Bradley) are renowned, they’re a big threat at set-pieces, with the power and the height. “It was a great ball in from JJ, a good run from Matty and a sublime finish. Team-mate Jack Stacey was of a similar opinion, saying: “It was textbook. Pearson was doubly delighted to notch in front of the away end which housed more than 2,000 Luton fans, his goal leading to plenty of renditions of his ‘magic hat’ chant. He added: “You see us travel in numbers and it’s for the fans, they’ve been brilliant all season. “Sunderland away, even coming here and it was just brilliant to score in front of that. It makes a change as at Coventry I scored in front of the wrong end, there were no fans there. “It’s good (the chant), it’s just what you want.